I have previously written about Johnny F. and Estella (Haskins) Dyer. For more information about their lives and to see their wedding photo click here. My husband is descended from John Dyer Davey, born in 1834, who married Mary Ann Harper in Lanlivery, Cornwall, England. They immigrated to the US with their family which included John Dyer Davey Jr. They lived in Dodgeville, Iowa County, Wisconsin. 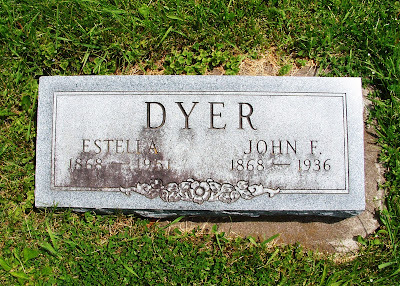 I've always thought the "Dyer" might be John's mother's maiden name. Wonder if there could be a connection here? Thanks for the comment! There is a good possibility we might have a connection. Dodgeville isn't that far from where my family settled down, and I've run across limited Dyers in the area. I haven't researched back that far on my Dyer line, but worked on it yesterday and will continue to do so. I'll let you know what I find!